There are a lot of premium as well as free CD/DVD burning software. Among them, Nero is undoubtedly one of the most popular commercial solutions available for users. The free alternatives are not far behind and can match the features and performance of Nero. Each of these CD/DVD burning applications is packed with unique and useful features. Through them, you can manage a large library of DVD data in a seamless manner. I've tested each of these DVD burning applications on my Windows machine and found them quite powerful and user-friendly. You can also backup, compress and cut your DVD streams through these handy applications. Some of the solutions mentioned here can run both on Windows and Linux platform. Some of these useful apps can also burn Blue Ray disks as well as can create different types of bootable disks for developers and professionals. If you frequently use compact disks for storing your important data and information, download one of these applications for the same. 1. 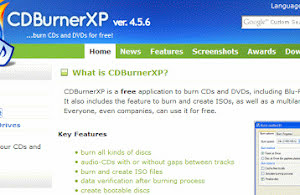 CDBurnerXP: This free and powerful application easily burns CD, DVD, HD-DVD and Blu-Ray discs through a nice and user-friendly interface. It can also be used to burn ISO images on disks. Professionals can also use it to create different types of bootable disks. It also verifies the integrity of the burned data. The application itself is a multilingual software and is very light on system resources. It can also be used to burn large data in multiple disks through disk spanning mechanism. One can also use it for storing DVD and CD data as ISO images on a computer's storage device. It also has a handy cover printing feature for both data and audio disks. Power users can also take advantage of its command line version. 2. BurnAware: The free version of this application has all the features of the premium version. It has a clean and simple interface even a layman can master within minutes. Its handy data recovery feature can easily retrieve your important files and complete folders stuck in a damaged or unreadable media disk. It's available for both 32-bit and 64-bit variants of Windows platform. It also supports disk spanning for spreading a large amount of data in several disks. Advanced boot options can also be configured as per the requirements. Its multi-burn feature can be used to burn more than one disks at a given time on a single computer having multiple burning drives. It can also be used to burn MP3 and audio disks. 3. StarBurn: This is an all-in-one disk burning software you can use to store almost any type of media on a CD or a DVD. It supports a wide array of DVD formats with custom writing speeds. Its video extraction module smartly omits ads and trailers from the original movie before saving the final extracted media. Its session import feature allows sequential burning of media in multiple sessions without loss of previously saved information. Similarly, it is capable of burning audio streams dynamically bypassing the step of uncompressing and saving the data to a local hard disk. I liked its wizard-based interface which makes complex burning process, a breeze. It runs on both legacy and modern Windows machines. 4. Ashampoo Burning Studio FREE: This free and intuitive application can be used to burn and write different types of DVD media disks. It has a nice interface with helpful prompts to burn rich media with ease. It is one of the best solutions to quickly make backup copies of CD, DVD, and Blu-Ray media disks. One can also burn entire folders with a single click without any need to transfer individual files or child subdirectories. It can also burn video disks on DVD and Blu-Ray disks in a professionally formatted manner. It can also be used to extract audio stream from the disks to store it on a local hard drive. While creating backups, it compresses and encrypts the stream to save space as well as to make it secure. 5. Free Burning Studio: As the name implies, this excellent free software can be used to burn and manage DVD and CD disks. Its flexible options let you create custom audio disks too. It can also be used to rip and burn ISO images. Its soothing interface with helpful menu options is a visual treat for anyone. It also gives you an option to directly burn video stream from your camcorder to a Blu-Ray disk. The application itself is light and free from any malware. It has no restrictions and the free copy works seamlessly with all the features. Bootable disks can also be burned through this software. It also supports wide formats of rewritable disks to save your important data in multiple sessions, whenever required. 6. AnyBurn: This simple yet powerful media burning application is ideal for beginners as well as for the experts. Like every other professional grade software, this one also supports wide formats of optical storage disks. Its easy-to-use interface is devoid of any complexities and just works out-of-the-box. It can also clone disks by sector copying method to create exact replicas of the media. While copying image files from the disk to the local storage, you can also change the file format as per your preferences. It's one of the lightest DVD burning application included in this list. It works seamlessly on older Windows version as well. I often use this application to store audio streams in MP3 format on my disk. 7. Astroburn Lite: Apart from burning different types of optical disks, this application is capable to erasing high capacity disks very quickly. It supports multiple languages and is also bundled with several preset skins to match with your taste. It supports multiple configurable writing speeds out-of-the-box. Disk verification ensures the written information is error-free before the burning process is started. Similarly, a user can also select his preferred file system for the disk. It can copy and write wide range different disk image formats. Its single window interface with easy options enables everyone to burn disks without any problems. It's not bulky at all like many premium disk burning solutions are. 8. ISOburn: And last but not the least, this tiny and free disk burning software is a must-have for every Windows user. Apart from burning regular optical disks, it can also be used to create custom boot disks, instantly. Its tiny footprint ensures you can run it on older Windows systems too without any issues. Its real-time event log enables power users to keep an eye on the tasks performed by the application during the burn process. A portable version of this application is also available which can be used while you're on the go and can be stored in your USB stick. Whether you want to write on a regular CD or want to burn a high capacity Blu-Ray disk, this tiny application is capable of managing all of them with ease.